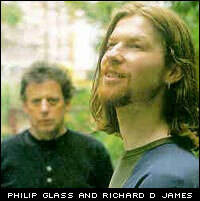 Philip Glass is a living legend among classical and contemporary musicians and Richard James, also know as Aphex Twin, has become a legend in the technology-using community. Richard Blaine asks what happens when two gods from these musical worlds collide? At 57, it might be a stretch to describe Philip Glass as an enfant terrible, but he still has the power to enflame the stuffed shirts of the classical music establishment. Quite distinct from his exquisitely formulaic composition style, his movie scores and confounding performance pieces are his regular dalliances with the lower orders. Collaborations with pop performers ranging from Linda Rondstadt and Paul Simon to Mark Moore of S-Xpress and, most recently, Aphex Twin, are all projects guaranteed to get the hackles of the Juilliard set rising. His extensive use of electronic instruments in compositions and live, mixed media performances has further enhanced his reputation as a maverick. Glass was born in Baltimore on 31 January 1937 and underwent a varied upbringing that's reflected in his music. He studied flute at the university of Chicago, composition in New York and Paris (under the legendary teacher Nadia Boulanger) and subsequently moved to India, where he studied extensively with Ravi Shankar. "That was enormously helpful," he remembers. "Had I not done that I would not have been able to solve some of the large-scale musical problems that came up in Einstein On The Beach," (Glass' 'opera' that elicited critical acclaim, outrage and stunned amazement in roughly equal proportion when it was staged at New York's Metropolitan Opera House). In Morocco he absorbed the arcane modalities of North African melorythms, which inform his own mesmerising use of melodic repetition. Eventually settling in New York, he initially found few outlets for his craft and was reduced to supporting himself with menial jobs. He formed associations with modern painters and sculptors who shared his objective of maximum effect with the minimum of means, and he became a close friend and associate of Steve Reich, himself no stranger to the power of repetitive phrasing. For Glass, far more rewarding dips into popular culture have occurred in the company of contemporary pop performers. His latest bed fellow is the Aphex Twin which, in light of recent work with Mark Moore of S-Xpress, seems a less bizarre meeting of minds than it might have. That's not to say it's not an intriguing mix; typically, Glass is unwilling to acknowledge the dichotomy. "He got in touch and wondered if I was interested in doing a remix with him," he states, as if it were a request from his brother-in-law to help paint the spare room, "and I said I would." Glass appears slightly bemused over how the project happened in the first place. "I'm not sure," he says airily. "He evidently knew my music. I didn't know him; he's quite a young guy... Richard James is quite a nice young man," he says, suddenly becoming focused - as if James' 'niceness' is significant in some way - "and I think someone suggested he call me." 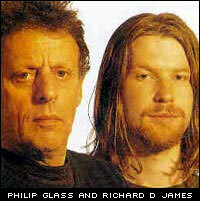 James actually wrote Glass an endearingly forthright letter that began 'Dear Phil' but the outcome was the same. "I didn't know his work", says Glass. "Oh yes, they sent me a tape and I listened to it. But I would have done it anyway because I was interested in him. The only way to find out about these things is to jump in and get your feet wet. You can't theoretically understand them: you have to get involved. That's the way I work." But was there something musically that caught his imagination? "There was as a matter of fact. I heard the music and thought, 'Yes I can do something with this."' What was that? "Just a kind of intelligence and musicality - basic stuff like that." The duo worked at Glass' studio in New York, with Glass writing much of the music on the spot. "He [James] liked it - he seemed to enjoy it and it was fun to do." Glass appears to view the liaison as an entertaining but brief interlude. It did, however, furnish him with a lasting impression of Mr. Twin. "This is a guy who conceptualises music," he says. "He hears it. That's what makes his music interesting, that's what makes him interesting. What I heard in his music was the intention to discover a different mode of expression. Whether he reads music or studied at the conservatory isn't important. Richard's a guy who began by building his own synthesizers when he was a boy, putting odds and ends together - pieces of junk practically making sounds then taking those sounds and turning them into music. That's interesting. I have some friends who go to the Berkley School of Music - it's a very good school - but there you learn the craft of popular songwriting. Basically, you're beaming how to make hits. If you're lucky you have enough talent to do it; but it's about formulation, it's about the recycling of ideas. It's not about building a synthesizer at home and making it burp and twurp and then seeing how it builds into a piece of music. He has a way of thinking that's simplistic, and it's interesting for me. I'm twice his age and more - I like meeting young people and seeing what they're doing." Glass denies that he is particularly drawn to house or trance music, even though it is tempting to identify parallels between them and his own music far too glib an analysis for Glass. "What I'm interested in is an innovative way of thinking," he says. "It comes out in this music because this is what that guy was thinking. It could just as easily come out as something else." So he doesn't think that it's necessarily dependent on technology? "No. No, because you can do it on the piano, too. You have to realise," he says with emphasis, "that I'm looking at music from a very different point of view; I come from a very traditional background. The historical continuum of the language of music is something that I'm trained in, and a lot of these guys aren't. They don't think that way: they don't think about that at all. But, on the other hand, I don't think about it all the time either." When Glass discusses his own musical background, you get a sense of just how broad and accommodatingly creative his mind is. I wonder if he ever envies the naivety of some of his collaborators - Aphex, in particular. "No, not particularly," he replies without pause. "No, I've never found knowledge a burden. But it's important to say that I do come to music through this way, that's my way of doing it, and I don't regret it at all. It's made it possible for me to do what I've done. A friend of mine, a Brazilian songwriter, gave me three songs recently and I'm going to write arrangements for them. I can do that because I've got the chops. It's not going to be hard for me, and it means I can enter his world in a way that I would have been unable to had I been a guy who knew only three chords, or a guy like Richard. Richard would probably not be able to do piano arrangements for this guy. He can do what he does, and he'd find his own way of doing it." What sets Philip Glass apart from his contemporaries is that where as they have an equal ability to extend themselves into different musical areas, they sniffily refuse to exercise it. Glass is in no doubt as to why. "They're a bunch of chickenshits, aren't they?" he grins. "They worry about what they're colleagues think and about being looked down upon and whether they've got a university job. It's looking at culture from a very narrow perspective, but I don't pay any attention to them. When I did "Einstein On the Beach" a lot of people were shocked and revolted by it. My activities are still considered revolting by some people, but those are responses driven by fear..." and, Glass thinks, the over-zeal-ous protection of their 'high culture'. "Culture is everything: culture is the shirt you're wearing, culture is the food you eat, culture is the newspapers that you read. Culture is any product of the collective mind and of the individual mind. It's all interesting, it's all valuable. I mean, culture is what human beings do. Someone like Richard is a very interesting young man - he didn't have the benefit of a classical education so he makes up for it in other ways. He makes up for it in ingenuity, in his ability to dream and imagine. To think that he needs to take a course in harmony to write music is an absurd idea. Paul Simon can't read music," he says referring to another of his sojourns into pop. "Now you tell me, who do you think is more important: some professor of music at Yale University or Paul Simon?". From the "Future Music" magazine (Issue 36, October 1995).